A Commis Chef And Chef De Partie Jobs Role- Where Do They Work? A Commis Chef And Chef De Partie Jobs Role – Where Do They Work? Whether you are considering starting a rewarding career as a professional chef or you have already started on your culinary path there are many things you need to consider including: where can I work in a commis chef and chef de partie jobs role. So a big decision you need to make is where are you going to work. There are many places that chefs can work and although it is highly recommended to start yourself off on the right foot and get the best foundation training possible. This is done by training at the highest level of cooking you wish to do, do you want to work at a Brasserie level up to a 2 rosette level in the UK? or move up to the fine dining level at Michelin star and 3 rosette and up places. If you are passionate, have a natural talent, have a great desire to work with and be the best whilst giving 10 – 15 years of your life in training to become a world-class standard chef then the fine dining career could be for you. On the other hand, if you want to work to a good standard and have a work-life balance. Then keeping yourself in the places working up to a 2 rosette standard will be more suitable. In the UK the traditional places chefs work are the restaurants, hotels, pubs and contract caterers. The UK there are an estimated 187 000 of these places combined. In 2016 there are currently 166 restaurants with 1 – 3 Michelin stars and 230 establishments with 3 rosettes and up, There are 230 restaurants at the fine dining level which is about a 0.1% of all traditional places in the UK. 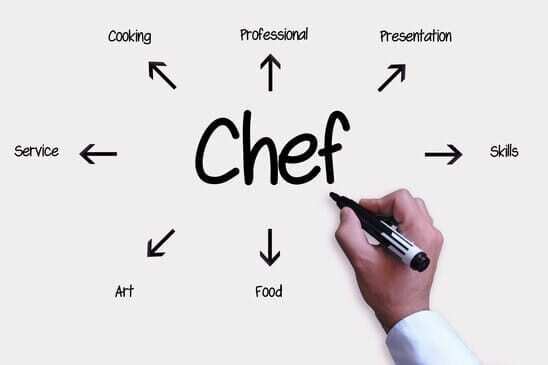 All These Are Opportunities For A Chef Career In The UK. Chefs Also Have The Opportunity Of Travelling All Over The World, Getting Paid And Experiencing Great Food. Let’s take a look at a few of the alternative opportunities to give some examples of, where can I work in a commis chef and chef de partie jobs role? To become an army chef is an interesting choice of career for a chef. As a chef in the British army, you will be serving dishes to a broad range of people from the new recruits to royalty. You will learn how to cook as a British army chef in the usual kitchen environment but also on the move in a pressured situation. You will learn the basic training soldiering skills and become a qualified chef. To become a chef in the British Navy is a solid choice of career, once your basic training is complete a lot of opportunities will open up to you. Benefits of becoming a British navy chef include six weeks annual holiday, a house purchase scheme, with a starting salary up to £18000 and the potential to earn up to £48000. Many championships and premiership football stadiums have a catering team working at the club. As well as producing the food on the big match day there are also many other functions to cater for. From a small stand stall on the big match day serving simple food to first class VIP dining functions. There are many chef career opportunities on large cruise ships sailing around the world. Also, there are many chef jobs on the smaller ferry companies to include cross-channel ferries offering a good salary. These types of jobs are fantastic for chefs. Seasonal jobs include winter ski seasons, summer seasons all over The Uk and Europe. There is also a range of other part-time jobs for chefs. There is a broad range of companies employing chefs these can be very diverse from World famous recording studios to London city law firms. Becoming a chef on an oil rig is a very demanding job. However, all your costs are usually covered and the earnings can be at the higher end of an average salary Job.